BERKELEY — A free event celebrating the life of Richard Aoki will be held on Saturday, April 21, from 7 to 10 p.m. at the Multicultural Center at the MLK Student Union, Telegraph Avenue and Bancroft Way on the UC Berkeley campus. Diane C. Fujino will present her new book, “Samurai Among Panthers: Richard Aoki on Race, Resistance, and a Paradoxical Life.” The program will include spoken word and presentations of AAPI Alumni Richard Aoki Scholarships. 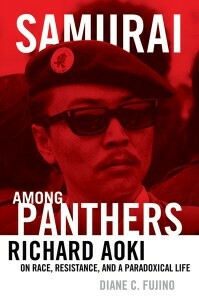 An iconic figure of the Asian American movement, Aoki (1938–2009) was also, as the most prominent non-black member of the Black Panther Party, a key architect of Afro-Asian solidarity in the 1960s and ’70s. “Samurai Among Panthers” weaves together two narratives: Aoki’s dramatic first-person chronicle and an interpretive history by Asian American movement scholar Fujino. Aoki’s candid account of himself takes us from his early years in Japanese American internment camps to his political education on the streets of Oakland, to his emergence in the Black Panther Party. Aoki’s voice rings clear in the over 200 pages of oral interview given to biographer Fujino, collected in 100 hours of taped interview sessions between 2003 and 2004. He describes in his own words the story of his life. The result is an 11-chapter treasury of Aoki’s transcript. Beginning with his early childhood with his family’s forced incarceration at the Topaz, Utah concentration camp, he takes us through his teenage years in West Oakland and Berkeley, to his military service, and subsequent political awakening with his growth as a revolutionary internationalist. His recollections of the formation of the Black Panther Party in Oakland catapult the reader into the heart of the Black liberation movement. Aoki became a key leader in the birth of the Asian American Political Alliance, the UC Berkeley Third World Liberation Front, and the 1968 TWLF Student Strike, which won the formation of ethnic studies, Asian American studies, Chicano studies, and African American studies at UC Berkeley. “Samurai Among Panthers” is a valuable addition to materials available to present and future generations in remembering, studying, honoring a key political leader of the Asian American movement. For more information, contact Eastwind Books of Berkeley at (510) 548-2350 or visit http://asiabookcenter.com/.